The Episcopal Church named Frances Perkins as a holy woman and welcomed her into the calendar of Lesser Feasts and Fasts. Although Frances died on May 14, 1965, the Episcopal Church decided on May 13 as the day for her commemoration because the 14th was already full on the calendar. 2015 is the 50th anniversary of Perkins’ death as well as the 80th anniversary of Social Security. An assistant to former Senator from New York Robert Wagner (1927-1949) regarded Perkins as the “one person…above all others who was responsible for there being a Social Security program. 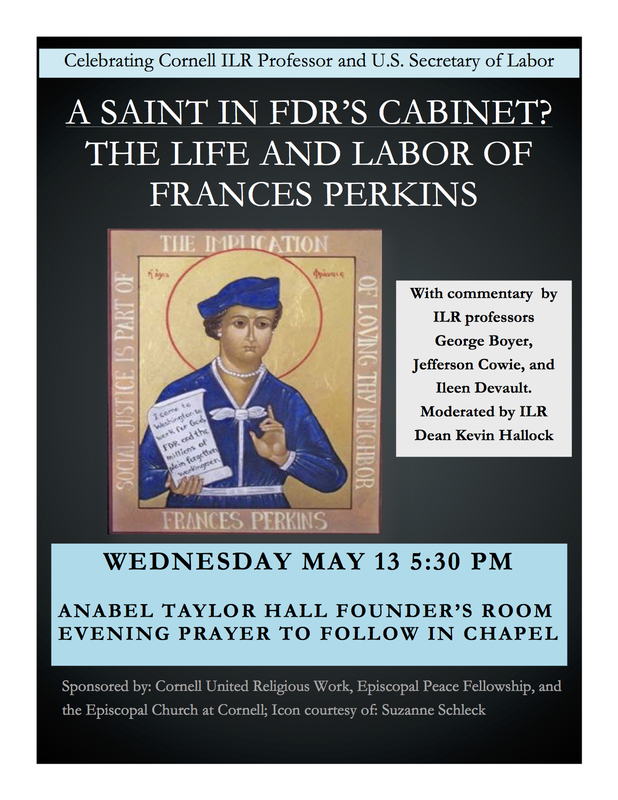 The Episcopal Church at Cornell (ECC) and the Episcopal Peace Fellowship (EPF) invite you to a celebration of the legacy and Feast Day of Frances Perkins on May 13, 2015. The event will take place in two parts: At 5:30 in the Anabel Taylor Hall Founders room on Cornell Campus, four professors from the Cornell School of Industrial and Labor Relations will give brief remarks about aspects of Perkins’ legacy. Following their talks, those who would like will be invited to head just across the rotunda to the chapel for a service of evening prayer to celebrate the Feast Day of Frances Perkins. The evening prayer will start at about 6:15 or 6:30 and lasting no later than 7 PM. Light refreshments will be provided courtesy of Cornell United Religious Work. Director of CURW, the Rev. Ken Clarke, is very pleased to co-sponsor this event with the ECC and the EPF at Cornell and will make some opening remarks. Parking in the lot behind Anabel Taylor Hall and the Law School is open by 6 PM and if you park there at 5ish, you ought to be okay. There is a secondary lot just down the hill from that lot which is almost always open with lots of parking.